Standard delegate class for rendering a view item. 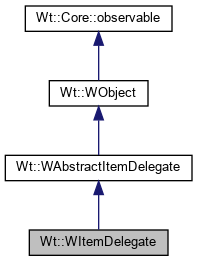 This class provides the standard implementation for rendering an item (as in a WAbstractItemView), and renders data provided by the standard data roles (see ItemDataRole). It also provides default editing support using a line edit. You may provide special editing support for an item by specializing the widget and reimplement createEditor(), setModelData(), editState(), and setEditState(). Creates an editor for a data item. The default implementation returns a WLineEdit which edits the item's Wt::ItemDataRole::Edit value. You may reimplement this method to provide a suitable editor, or to attach a custom validator. In that case, you will probably also want to reimplement editState(), setEditState(), and setModelData(). The editor should not keep a reference to the model index (it does not need to since setModelData() will provide the proper model index to save the data to the model). Otherwise, because model indexes may shift because of row or column insertions, you should reimplement updateModelIndex(). // We use a layout so that the line edit fills the entire cell. The default implementation returns the current text in the line edit. You will need to reimplement this method for a custom editor. The default implementation resets the text in the line edit. You will need to reimplement this method if for a custom editor. The default implementation saves the current edit value to the model. You will need to reimplement this method for a custom editor. Sets the text format string. The ItemDataRole::Display data is converted to a string using asString() by passing the given format. Returns the text format string. When the flags indicates Wt::ViewItemRenderFlag::Editing, then createEditor() is called to create a suitable editor for editing the item.